All memberships expired December 31 - Renew now! 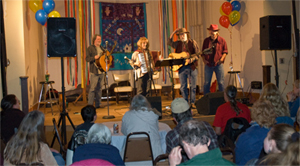 Since 1978, our weekly folk music concerts have been a Madison tradition for 40 years. Concerts are held in the idyllic setting of an old church (now the Wil-Mar Community Center) on Madison's near east side, just one block off of Willy Street. The smoke-free atmosphere is relaxed with dim lighting and candles on the tables. Teas, natural juices and locally ground coffee available. Fresh baked goods, such as cookies, muffins or whatever the volunteer bakers made this week are also available. 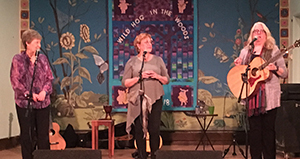 The scheduled folk musicians, singer/songwriters and story tellers are the finest in the area, the state and the nation, featuring many local performers along with regional and national acts that are traveling in the area. The open mike is a mix of local/traveling, amateur/pro, folk artists/songwriters and are always a surprise. Sign up at the door when you arrive if you would like to perform a couple of songs during the open mike between sets. Admission pays the rent. Performers are paid from the money the audience puts in our ceramic wild boar piggy bank, affectionately called Phillup the Pig (pronounced fill-up). Admission is typically $2 for members and $4 for non-members (higher for special events). Concerts are held September through May on Fridays, usually starting at 7:30pm. Door opens at 7:00pm. Check our calendar for concert details. On Madison's near East Side, we are located just one block south of Willy (Williamson) Street on Brearly at Jenifer Street. The coffeehouse is in an old brown church building converted into the Wil-Mar Neighborhood Center. Parking is available across the street and we have easy access to bike paths. Metro bus stop for Routes 3 and 4 is across the street. Wil-Mar is accessible from the Brearly Street entrance with a lift between floors. We serve baked goodies, juices, large selection of teas, Klarbrun flavored waters, and Steep & Brew's Wild Hog Blend decaffeinated coffee. Caffeinated coffee is available in tea-likke bags. We are members of an all volunteer run, non-profit organization based on cooperative principles. 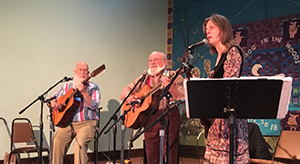 We are dedicated to promoting, preserving, and enjoying all types of traditional folk and acoustic music, by providing weekly live performances in our coffeehouse, and occasional special concerts, dances and other events and partnering with other local folk organizations when appropriate. What is Wild Hog in the Woods, Inc.? 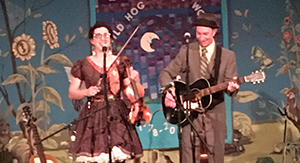 Wild Hog in the Woods, Inc. is a non-profit, tax-exempt IRS 501(c)(3) educational and historical corporation organized to advance the public knowledge of folk arts and dedicated to providing a stage where anyone, from first time on stage to seasoned performers, can perform for folk-loving audiences.